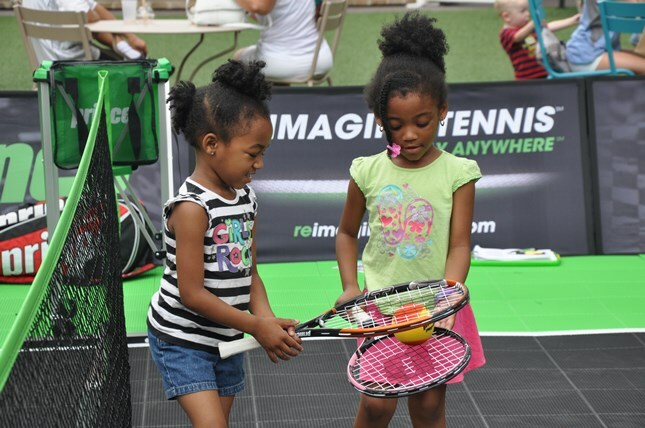 Serving as the annual kick off to the 2016 tournament, the BB&T Atlanta Open could possibly host tennis’s future talent with Kid’s Weekend on Saturday, July 30 and Sunday, July 31. With the purchase of an adult ticket, up to four kids can see the opening weekend qualifying matches. It's a great deal for the entire family and an opportunity for children to get play and watch tennis. “Kids Weekend allows an adult to buy a ticket and up to four kids, 18 years of age and younger to get in free,” explains Eddie Gonzalez, BB&T Atlanta Open Tournament Director. Young tennis players are invited to partake in activities at the tournament’s Family Zone. In Atlantic Station’s Central Park, kids can hit tennis balls on 36’ tennis courts and learn more about the sport from USTA staff members. The Family Zone will be open to kids the entire tournament. “We have (well) over 300,000 people that played tennis last year in Atlanta, the most of any city in the world,” said Gonzalez, who advocates Kid’s Weekend. The BB&T Atlanta Open commemorates its seventh year with an Olympic theme in honor of the upcoming Rio 2016 Olympic Games. The Olympic theme will be prevelant throughout Atlantic Station with the chance to meet current and past Olympic athletes. The 1996 Atlanta Olympic Games 20th Anniversary Exhibit presented by Coca-Cola will be open 11 a.m. - 6 p.m. each day and is located next to the Atlantic Station Publix. Appearances will be Kayla Harrison (July 30,31), Nancy Kerrigan (Aug 1), Gigi Fernandez (Aug 2), Kent Steffes (Aug 3), Brooke Bennett (Aug 4) and Gail Devers (Aug 5). The BB&T Atlanta Open serves as the third of nine tournaments in the Emirates Airlines U.S. Open Series. The series leads up to the last major tournament of the tennis season, the U.S. Open in New York. Tickets on sale now at www.bbtatlantaopen.com or by calling the ticket hotlines at 855 307-1981 or 404-941-9202.